Where is that pizza? That beer? That stamina from my youth? Is that too, captured in a box? Why is it that we tote our memories from one place to the next? Did we really need that? What was that quote by an anonymous face on an anonymous night in anonymous New York? What was the advice for what is to be left behind as a legacy? Rest assured that I will not be around to pack them in boxes. 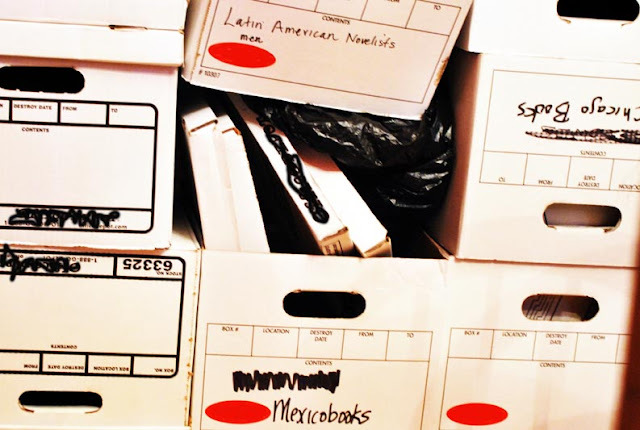 ha...we tote quite a few boxes through out moves...some unopened in years....do we need them...prob not...i guess there is some assurance in them...i try to catch as many of mine and put them on paper as i can...at least then others can share them and be done with them...smiles. Happy New Year my friend! If it wasn't for the fact that I can't settle down I'd love to settle down and never have to deal with Pandora's Box. Good thing for photo apps, not we can keep memories where ever we go. Be fore than it was really a lot of work at keeping them. I get this. I lost a storage bend of some of my best things. I am grateful for the digital age...three external hard drives...a dozen photo cards...and the space they create. I no longer have albums or cds and as hard as it is for me to wrap my head around the idea of a virtual bookshelf I do see a day when all my books will be Kindled or whatever the leap is after Amazon goes the way of the Amazon rain forest. the culling, cutting, saving, and dumping. ...and how is that battle shaping up Glenn? The older I get, the more moves that I make the more that I value a good mover with a good back! Yeah I never know how much crap I have until I move. Then half of it gets thrown out or sold anyway, why we hang on all this crap sometimes is beyond me. i'm not much of a collector...as you say..we need to have the memories and treasures in our head and heart instead in boxes.. I keep many boxes and sometimes glad I do for I forget the good times so quickly.